Manuel told us that all the hotels in Santiago were totally full especially the special Parador (state hotel) called Reyes Católicos (Catholic Kings). He finally got us a room at the Meliá Araugany. The 45 mile Autopista drive (Marcia) took only an hour and we checked in at 9:15. When we got to the room we discovered we had a two room suite with 2 bathrooms. We paid dearly for this. This is a special place with a special complicated story. It dates way back to prior to the middle ages when it was said that apostles of St. James the Greater (one of Christ's original 13) brought his bones in a stone boat to the west coast of Galicia and carried them inland to be buried here in what is called Santiago (James) de Compostela (either = composte or Latin for field of stars: campus stellae). Somewhere there started this idea of a pilgrimage to visit his grave that started (and heavily promoted) all over Europe. If one walked (did the Camino) all the way to Santiago, the church would wipe away half your time in Purgatory. So many people made this trek (see Map photos) during the dark ages that an entire industry was set up with places to take care of the pilgrims along the way. They came from as far away as England, Sweden and Finlandia. It is hard to relate to in modern times (except maybe Disneyworld). People still do it today (many non-Catholics) but the rules are that you must walk a minimum of 100 Km or bicycle a minimum of 200 Km (a little easier today). 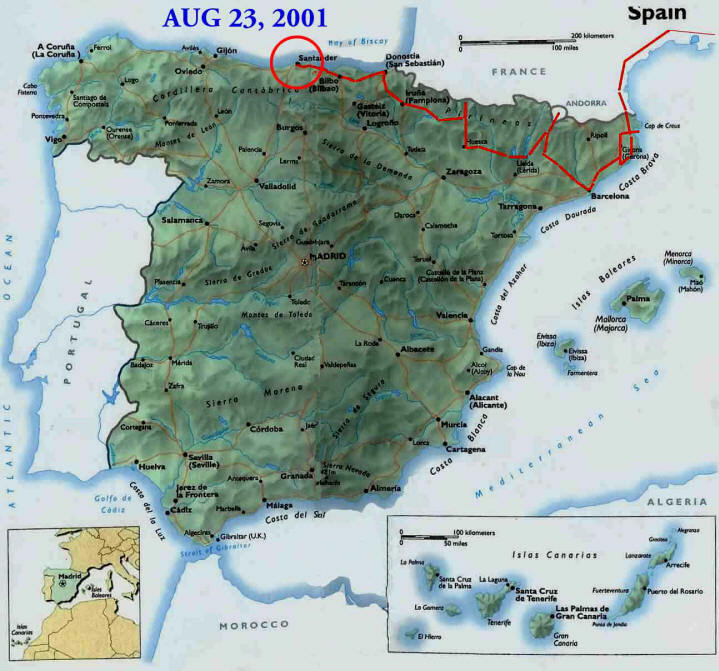 We thought about this for quite some time and decided we would use the BMW for our Camino Santiago (Barcelona to Santiago)- we found out later that that didn't count, so we were not allowed to be classified as true pilgrims. Maybe next trip. The scallop shell (see photo and sign) became the symbol of the pilgrimage and you see it everywhere. You had to bring one with you when you finally arrived at the church, then kiss the statue at the entrance and put your hands in the holes (photo). All this made me hungry for my favorite dish, scallops (no cholesterol)! The evening we arrived, we hiked over to the old city and to the grand Catedral that was constructed for all this hoopla. What a grand site it is. It was begun in 1075 by Master Mateo and in 1189 Pope Alexander III decreed Santiago a Holy City along with Jerusalem and Rome. In 1589, while being attacked by Sir Francis Drake (English Protestant), the bones of St. James were hidden. Later no one could remember where they were hidden until a workman discovered them in 1879. How'd they know they were real? A skull chip stored in Pistoia, Italy matched the skull found perfectly. Now we get to the hard part. St. James is believed to be the real twin brother of Jesus. It is said that St. James came alive and defeated the Moors in the Battle of Clavijo in 844. Now, for me, they're over the top. Anyway, all this makes for a very important historic and religious city to visit, one of the most important in Spain. There are several streets leading to the Catedral that are lined with restaurants (Rua Franco, Rua Vilem) and we decided to choose the one with all the charm and the hams hanging from the ceiling, called Casa Elisa. I enjoyed a scallop and a crab while Marcia had tuna empanada (photo) and a steak washed down with a bottle of Rioja red. We meandered home, put the car in the garage and hit the sack. Sunday morning I am heading for the 12:00 Mass which is the only time of the whole week that they fling the botafumeiro. This is a huge incense holder weighing 35 Kg suspended from a rope in front of the altar (photo). The Catedral is shaped like a cross and the botafumeiro is swung across the side arms of the cross. It takes several men to do it and they really swing it very hard so that it almost hits the roof. Why did this get started? Well, in the Middle Ages so many pilgrims slept inside the church (unbathed) that the smell was so bad they wanted the incense to really be useful. Going to the wrong door I wound up being 15 minutes late and they wouldn't let me in. Pilgrims with their backpacks, walking sticks and Camino passports stamped were let in. Because we would miss the 12:00 Mass and the botafumeiro, a lady from Tuscany and I tried to fight our way past this guard (22 year-old) to no avail; he wasn't going to be swayed in English or Italian. As it turns out they don't swing it until the end of the Mass and they opened the side doors so we could see - my video caught it all. After the huge applause, 14 million people all tried to get out of the church at the same time while I was trying to get in for the 1:00 Mass. After much jostling I even got a seat in the front row for a very quiet and normal service (instead of a spectator event) which was very nice. After touring the Catedral and viewing the bones of St. James (photo) and seeing the interior, Marcia joined me for coffee at the Parador Reyes Católicos (photo). We at least saw it, Fernando. We toured that and decided to make the real final journey of the true Camino Santiago, that is to the spot where the stone boat brought his bones, Finisterre (Land's End). It is the farthest west you go on land in Europe and it was believed to be truly the End of the World - past here the souls were waiting. We drove along the tortuous coast road and saw many small quaint little Spanish towns (photo), one after another. The 75 miles took us 3.5 hours and after arriving at the fishing village of Finisterre, we had to drive another 3.5 Km to get to the lighthouse (faro) at the very tip of the peninsula (photos). Marcia drove back to the village while I did my run back, one of the most exhilarating runs I have had here - it was great. By now there was no way we could get back for dinner in Santiago, even with Spanish late dining hours so we stopped in a very cute fishing village near Cée called Corcubión and had a nice dinner of sardinas and pollo. David, our waiter told us not to go back by the coast but to use an inland route that my map showed as having unsurfaced roads. We trusted him and those roads were the best of the trip back. Marcia made me drive and I got back in 1:20; another long day - but what a day.